Cassandra by Starlight is written by Susan MacNicol, Susan’s writing is great, the entire story and plot flows smoothly, the main characters were well written and you get enough information to get to know everyone, for me it was one of those stories that you don’t want to put down. This novel has elements of romance, suspense and some laughter. 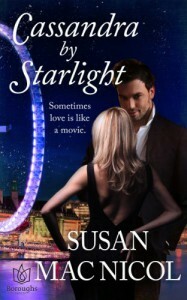 Cassandra by Starlight was refreshing to read and I have to say Susan MacNicol did a terrific job and kept me entertained right till the end of the book. Cassandra is having a bad day and it’s about to get worse; first she wakes up with a bit of a headache due to the wine she drank last night, then on her way to work she gets stuck in slow moving traffic, she even pulls out her kindle knowing she may be there for awhile. And before she knows it something or should I say someone crashes right on top of her car. All Cassandra can remember is a man telling her to hold on. In the hospital we meet Ian a doctor who has suffered loss and feels bad for Cassandra and attraction to her. Then we meet the brother (Bennett) of the man who landed on the car who also feels it is his responsibility to make sure Cassandra is okay. Bennett who is not only from money happens to be an actor and is doing quite well for himself. But he has some family issues/secrets. He also continues to see Cassandra and here begins a great start to a passionate romantic relationship or so they try. But as I said not all is roses with this relationship, Bennet has a stalker and it appears both Cassandra and Bennett are receiving calls from unknown numbers. We also learn the Bennett’s family has plans for him and really would like him to marry and have children with a woman who his father knows is much better suited for him. To them Cassandra will always be a reminder of how they lost their younger son. Cassandra does worry about the age difference as she is 10 years older than Bennett, and if that wasn’t enough Bennett is also from a well off family, he is talented and desired from women all over. Can Cassandra get past all of this? So put all this together and you find yourself caught up in a pretty fascinating story. I have rated Cassandra by Starlight a 4 star rating, and would defiantly recommend this book to anyone who enjoys a good romance/suspense and touch of humour story. I received a complimentary copy of this book as a part of a blog tour to review.